We’re behaving like frogs in warm water. We swim around untroubled, cooled by our faith in Indian liberal democracy. We are blind to the bubbles popping around us, the bubbles warning of fundamental changes, says Mihir S Sharma. India’s decades of liberal democracy have rightly been described as a “miracle”. In a country so complex, so divided, the odds were always against the success of liberal democratic institutions. And the success of democratisation has been about more than the State; it has been crucial in the ongoing transformation of Indian society, which has changed more in the past 70 years than in the centuries before them. Because we have -- with the exception of one depressing interregnum -- avoided obvious one-party authoritarianism; because we have an admirably apolitical army; because we consider the universal franchise sacred, and have avoided the kind of open battles between regions or between town and country that have plagued even more economically advanced developing countries; because of all these things, we tend to think of Indian liberal democracy as unchanging, as robust, as unshakeable. In other words, if today you worry in public about the future of Indian democracy, you are mocked. Another Emergency is, as everyone up to and including Finance Minister Arun Jaitley has said, impossible. Great! We can rule out that one particular and specific form of power-grab. So what? I think that we’re behaving like frogs in warm water. We swim around untroubled, cooled by our faith in Indian liberal democracy. We are blind to the bubbles popping around us, the bubbles warning of fundamental changes. Consider, for example, the incredible silence -- the complicity, in fact -- of almost the entire political, intellectual and journalistic class in what is so obvious a vendetta it looks like it’s being directed by Francis Ford Coppola: the witch-hunt against Teesta Setalvad. Setalvad has questions to answer about her NGO’s finances. But it is frankly laughable to imagine that the 18-hour long raids, the interrogations, the leaks and so on are anything but a vindictive campaign of harassment -- payback for Setalvad’s highly visible stand on the 2002 Gujarat riots. Yet, there has been nary a peep about this obvious misuse of State machinery. The government’s intrusive changes to the regime governing foreign contributions to, and the licensing of, non-governmental organisations is a larger symptom of the same disease. Imposing greater transparency on NGOs is a good idea. But the small-minded, targeted pettiness behind the attack on Greenpeace India, an organisation that is meant to espouse politically unpopular positions, had to be called out by the court. Thank heavens -- because it was difficult to find a voice among India’s elite, or even its people at large, that would stand up for NGOs with as obvious an anti-national agenda as protecting India’s environment. You know, it is wrong to say that Narendra Modi has done little in his year-plus as prime minister. This impression is common among those distracted by his casual and incoherent approach to economic reform, which was never his interest or his priority. Modi is, in fact, settling in for the long haul. He is solidly and intelligently putting into place the structures that will change the nature of India’s liberal democracy forever, and make it something that he, his organisation, and many of his voters will be more comfortable with. Consider this: which are the only two major administrative or institutional reforms that the Modi government is pushing? I’ll tell you: the judicial accountability law and the monetary policy committee. In other words, things they see as disempowering that pesky and uncontrollable Raghuram Rajan, and disempowering those irritating Teesta Setalvad- and Greenpeace-loving judges. On any of the dozen institutional reforms more urgent than the monetary policy committee, there’s complete silence. No greater independence for regulators. No independence for public sector companies, no privatisation of PSU banks. Instead, the government will focus on ensuring that the highest decision-makers in the land are ideologically and personally loyal. This is why only one man makes every personnel decision in the government: the prime minister. Other important positions must also be filled by the kind of person that Indira Gandhi’s acolytes called “committed”; but these can be left to people like the HRD minister. Smriti Irani is unfairly attacked for sitting on every important appointment committee. Come on! That is precisely what she is expected to do. “Detoxification” is an RSS HRD minister’s primary task. Manmohan Singh was brought down by interference, dissension and leaks at the highest level, among the babus and judges and politicians with secrets and with power. For many reasons, Modi will not make the same mistakes. Thus we have reached a point when the home minister can tell his bureaucrats to not talk to journalists, and there is a wide cry of approval -- even from some journalists. We have reached a point when the senior-most “apolitical” decision-makers in the country can look people in the eye and declare that the prime minister is the most patriotic Indian. We have reached a point when Prasar Bharati can be put back under the information ministry’s direct control, and heads nod in agreement. We have reached a point when even institutions that provide non-partisan, expert guidance and advice to the prime minister, such as on, say, India’s strategic trajectory, can be shut down -- and replaced by an informal network of “committed” people known to Nagpur and the PM. For the Rashtriya Swayamsevak Sangh, this is business as usual. Anyone from Kolkata will make an easy diagnosis: the RSS is just like the communists. Neither can permit ideological “independence”. Mark that: ideological independence. This is why “even-handed” comparisons to previous regimes -- after all, the harassment of foreign-funded NGOs started under the last government -- are woolly, mistaken, false and downright dangerous. The Congress put its own time-servers into many positions. But, as the last years of the United Progressive Alliance showed, when many hand-picked babus, economists and activists turned against the government, the Congress did not pick ideological foot-soldiers the way the communists or the Sangh does. At best, it picked people from a broad right-of-centre to left spectrum who were reasonably good at their job and reliably “secular”; at worst, they picked people who paid obeisance to power. To compare this to the Left or the Sangh is, as Amartya Sen has recently pointed out, to ignore the history of our institutions. For in places where the Sangh or the Left are granted sustained control by the people, then they have a chance to implement their transformative agenda. Regardless of whether a body is State-run, quasi-State, independent, non-State, it needs to be infiltrated by the committed, and taken over. Eventually, the organs of government and most of mainstream civil society speaks with one voice. And do note one crucial fact: this process can have democratic sanction. For this single voice can be, as it was in West Bengal for years -- and as it is in countries across the world, such as Russia -- the voice of the majority. It is worth remembering, in this context, something that many people murmured during the commemoration of the Emergency’s anniversary recently. Indira Gandhi’s illiberal interregnum was not as unpopular as the mandate of 1977 would suggest. The arrests, censorship, the suppression, mattered little. The vote-share swing away from the Congress would have been too marginal if not for opposition unity; and even that vote-share swing would probably not have materialised without the forced vasectomy campaign. Democracy is popular. (Literally.) That should not lead us to believe that liberal democracy is also popular. Too many people think that elections are all that matter, and dissent has nothing to do with democracy. The Indian exception, the Indian miracle, the Indian liberal democratic outlier, may not be as robust as we think. Perhaps the Chinese Communist Party, or the political sages of Southeast Asia, will turn out to be right after all: democracy can be “managed”. I sometimes worry -- and I hope I’m wrong -- that, just as China moves towards some form of limited, managed, illiberal popular democracy, that India too will symmetrically reduce those elements of dissent and independence in its current polity that have made it unique. Perhaps we and China are converging on the same point, but from different directions. Recently, I spoke up for Indian liberal democratic traditions, especially to do with NGOs and public protest, at a conference that featured representation from Russia and China. But perhaps I shouldn’t have; perhaps I was failing to represent. For it is possible that this element of Indian democracy is precisely what the majority of voters do not particularly care for; or at any rate, care about. The Russians and the Chinese think they’ve cracked the code; Mr Modi, in his harassment of opponents, his licensing of NGOs, his accusation that they serve foreign interests, is just following in Vladimir Putin’s 15-year-old footsteps. Putin has replaced the chaotic divisions of Boris Yeltsin’s time with an impressive uniformity of opinion -- inside officialdom and outside. Putin can now afford to be as direct as this, in one of his four-hour phone-in interviews last year: ‘I’m being honest... the border between opposition and fifth column is very difficult to place.’ Disloyalty to Putin is very close to disloyalty to Russia. Almost impossible for Putin to distinguish, in fact, and he is the one who does all the distinguishing. For Modi, there would no doubt be less effective paths to tread. Putin is today, I suspect, even more popular among his people than Modi is among his. Historical and political arguments that base themselves on national character are almost always erroneous. The Indian exception springs not from the “Indian character”, but the special circumstances of this country’s birth, and the exceptional nature of its first leaders. There is nothing special about the Indian character that means it is less docile and more accepting than the Russian or the Chinese character. Thus there is no reason to suppose that, if they are offered a bargain similar to the one the Russian and Chinese leaders offered their people, a majority of Indians will not accept. Among the most famous stage directions in theatrical history -- perhaps second only to ‘Exit, pursued by a bear’ from A Winter’s Tale -- is the one that ends Pushkin’s great historical drama about usurpers and tyrants, Boris Godunov. A new tsar is presented to the Moscow mob; and the play ends with the direction: “Narod bezmolvstvuet”, or “the people are silent”. Politicians, historians and theorists have argued ever since: does this mean a tyrant can cow down the people? Or does their silence mean acceptance – indeed, legitimacy for the ruler? I will say just this: “The people are silent” does not reveal something special about the Russian character. It is a danger and a warning to all countries; silence is easy. Silence is efficient. Noise is difficult. If you want the noise of a liberal democracy, there is a price to be paid. Sometimes, some countries don’t want to pay it. Today, as we swim around pretending froggily that the water is oh-so-cool, denying the path that we are on, it’s worth remembering that silence is acceptance. And that Indian democracy may well last a thousand years, but liberal democracy need not. 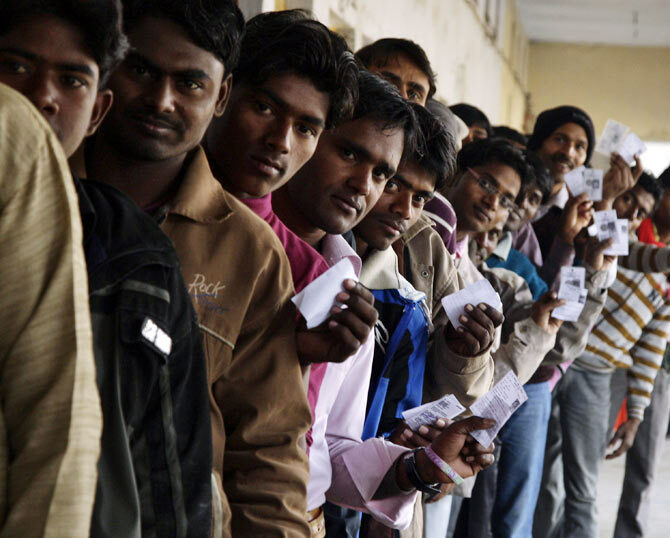 Image: A file photograph of voters in a polling booth in Uttar Pradesh. Photograph: Jitendra Prakash/Reuters. Beware, this 'impatience' with Democracy!